I spent three seasons on an organic vegetable farm in Virginia when I was in my twenties. The farmer there frequently quipped, “Anyone can grow food. The hard part is selling it to the right person.” While “the right person” is not a static demographic across the board, for small-scale farms, it often means someone with money. Or at least someone who has enough money to spend $7.00 a pound on tomatoes, and 6.00 a pound on broccoli and $20.00 for a four pound chicken. In other words, not your typical permanent resident of Delaware County. And yes, you’ve heard it all before. The particular conundrum of sustainable farmers charging what the real price of real food costs, while the benefits of the real food stay primarily in the hands of those with real money, or at least extra money, ironically not the same population generally suffering from obesity, diabetes, and other food-associated health problems. Here in Delaware County numerous initiatives are underway to rebuild a vital farm and food system, and get youth, seniors, and just regular eaters engaged in eating locally. In Walton, we kicked off one local food initiative with the Walton Farm to School Project, which received funding from the Catskill Watershed Corporation to pay Walton High School students to grow food for the Walton community. Our motto was “Grown Here to Eat Here”. The larger objectives of the project were to get local food into the school cafeterias and teach students the process from Arugula to Zucchini of growing, harvesting and marketing organic produce. The focus of the 2010 season became selling our organic produce to the Big M. This was, as they say, a hard sell. What we delivered was beautiful. Fresh and vibrant, newly-washed, the produce practically sang opera. However supermarket policies dictate that the newer product sits in the cooler until the older product sells out. While logical on some level, it often meant that our produce on the shelves was older, drying and wilting. More raspy Johnny Cash than glorious Maria Callas. Also, we had more swiss chard and kale than the Walton population was willing to purchase, and our other more palatable crops (cucumbers, beans, squash and zucchini) just couldn’t compete with the box truck prices no matter how low we were willing to go. So we gave boxes of high quality, organic produce to the food pantry on Friday afternoons. “Grown Here to Eat Here” was our motto after all, and since our project was subsidized by grant money, we could afford to essentially give it away. Local? Yes. Economically viable? No. We also experienced significant marketing challenges. Our efforts to introduce Waltonians to the multiple benefits of kale (in the form of pamphlets, recipes, Hail to Kale signs, etc.) often resulted in damp, unreadable signs – shredded paper over the produce. The Big M simply did not have the staff, the time, or the ability (desire?) to effectively laminate all of our signs, so much of what we brought in was packaged up in plastic (it will last longer this way, we were told) and sold alongside the produce from Chile and California with no distinction. Ultimately we moved a few thousand pounds and dollars worth of produce through the Big M. We had a small, but devoted following, and for that we are enormously thankful. We still had the fall school cafeterias to feed. However, lo and behold, kale isn’t such a hit with 9th graders either. 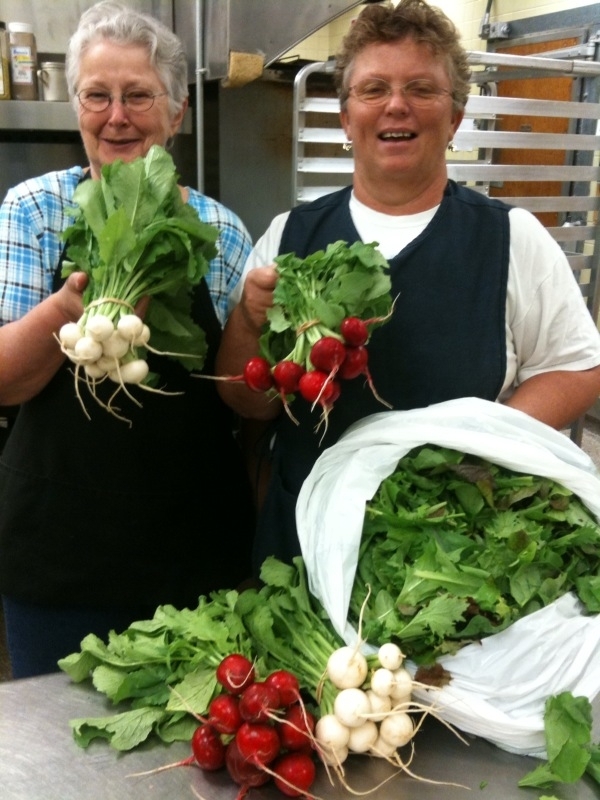 We did get salad, spinach, radishes, swiss chard, peppers, tomatoes, and yes, kale into the cafeteria, but when abundant fall rains flooded our fields, our growing season came to an end. All is not lost. The students learned a great deal and the ball was set in motion to ensure that high quality food gets to those with limited resources. For more information on the Walton Farm to School project, contact Rebecca Morgan at 607-865-8747 or rebamacmorg@hotmail.com. Rebecca Morgan is the Walton Farm to School Project Volunteer Coordinator located in Delaware County, NY.